Addium Review: Is This Really An Adderall Alternative? 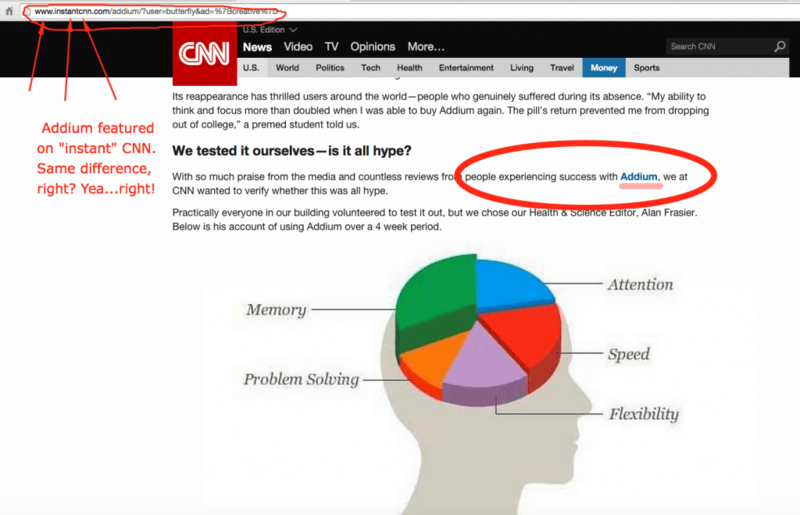 Addium Review: A Legitimate Adderall Alternative or Just Another Adderall Cheat? The amount of requests we’ve received to review Addium has been shockingly abundant over the past month. Does the Addium pill deliver or has it been busy running on marketing hype? We’re here to provide you with all the answers. Is Addium as good of a nootropic brain supplement as it promises to be? Or is it just another Adderall scam? Is Addium truly a natural alternative to Adderall or is that simply what Addium wants you to believe? We must admit that we were quite impressed with Addium’s official website when we first visited it. It was clean, easy to navigate, and complete with resourceful menu tabs on how it works, ingredients, and a few testimonials. They also explained the aim of their product in three simple steps: 1. It increases energy, 2. It increases focus and 3. It increases brainpower. 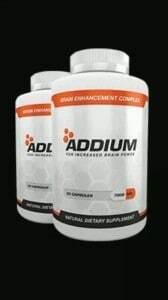 Addium has also successfully managed to disclose which ingredients are included in their formula, which deserves a big thumbs up because we’ve started to notice that more and more companies are beginning to hide this information. Sometimes a company may decide to re-brand for a number of reasons and perhaps they decided it was not ethical to have a brand that used wordplay on the popular ADHD prescription medication, Adderall. Perhaps, they wanted to grow and expand their image. We have no problems with these reasons. However, we learned that there was much more behind the truth of the reason that Addium made the change to Cogniflex. Why Did Addium Change their Product and Change the Name of their Brain Pill? After quite a bit of research, we learned that Addium was playing with their marketing in a manner that sent off the red flags. They took a dishonest and false claims approach much like we discussed was taken by other companies in our Geniux review. They were loose-content websites that made crazy false claims about what the product will do and used completely fake quotes from huge celebrities to give their product more credibility. You know the ones that I am talking about from the likes of Tiger Woods, Denzel Washington, and Bradley Cooper. We also noticed that they were using fake highly credible news media outlets to appear as if they were written up by the major news outlets like you can see in the image here. Then, of course, the infamous fake tweet from Bradley Cooper saying that Addium was the “inspiration” behind the idea for the movie. A movie that actually was released years before the supplement hit the market. Once we learned about the false advertising and unethical marketing practices being used to promote Addium at the knowledge of the company, they virtually lost all credibility with us. The most senseless part about this approach is that unlike Geniux, Addium at least carried a set of ingredients that are known to provide some types of cognitive enhancement. However, nowhere near the levels that they were claiming. At the end of the day, Addium was a middle-of-the-road type of nootropic supplement that we probably would have ranked that way. However, when you clearly have something to hide and take immoral advertising claims so far that you are forced to change your brand name to “Cogniflex,” we no longer need to know more. Addium was attempting to fool people by claiming they had created an all-natural Adderall alternative. They were far from anything like Adderall and we don’t believe anyone should believe they will receive the type of benefits that you may experience from Adderall by using Addium or Cogniflex. Since we realize that the majority of our customers suffer from ADD/ADHD and are looking for an effective Adderall substitute, we try our best to go through each product’s list of ingredients in order to make a factual, scientific-based evaluation, rather than a biased one. Therefore, we will share the original Addium ingredients which clearly show that it will not deliver the same effects of Adderall. Tyrosine — Improves neural communication network, which allows better focus and enhances mental alertness. GABA — Although initially thought to be a powerful nootropic, recent scientific evidence has shown us that GABA is incapable of crossing the blood-brain barrier, making it an ineffective substance. Bacopa Monnieri — Allows better cognitive function (such as memory and learning) by increasing blood flow to the brain. Alpha GPC — Maintains the health and synaptic function of nerve cells, which allows effective neural communication. Vinpocetine — Increases mitochondrial metabolism, providing us with better focus. Huperzine A — Prevents acetylcholine (neurotransmitters that are responsible for learning) inhibitors from taking action. While the majority of the ingredients are well-known nootropics that have been proven to work effectively in terms of helping memory recall and focus, we do have to point out that Addium concerns us with its use of a completely futile substance – GABA – and a very cheap, mediocre compound – Bacopa Monnieri. Addium does not consist of some of the more potent and powerful nootropics that may truly make a difference or should be considered one of the best nootropics for ADHD like we found with Nitrovit. Here is just one of the other negative Addium reviews we were able to find. Contains a few esteemed nootropic ingredients, such as Huperzine A and Vinpocetine. Customers have claimed that it helps to improve memory and focus. Does not contain caffeine, which allows a smoother energy release. May not work for everyone. Contains GABA – an ineffective substance. Known to have used false advertising and misquoted celebrities on purpose to give themselves credibility. Known to have used fake tweets and websites made to look like they were from credible resources when major media outlets truly had nothing to do with them. Overexaggerated claims about what their ingredients can do and many ingredients that formulate this stack are the same as their competitors. Used questionable reasoning for having to change the product name but we are assuming that it had to do with legal troubles and customer complaints. Moral questions in marketing hype approach that give the entire industry a bad name. We continue to see more customer reviews that complain about the product’s ineffectiveness. One potential reason behind this may be because the formula has been listed under “proprietary blend”, meaning we don’t know the dose of each ingredient. For this reason, the pill could very well be composed of 70% of GABA (completely useless) and only 30% of all the good stuff. Who knows? But while the product seemed to be very well-made and of high-quality at first, further research allowed us to dig up some dirt. 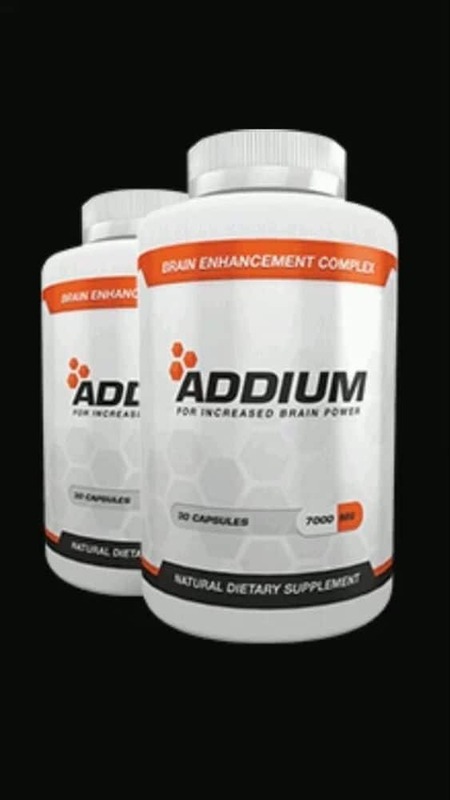 The bottom line is that at the end of the day, Addium used some very questionable marketing strategies that tend to give the entire nootropic brain supplement industry a bad name. They were dishonest in their claims and used flat out false advertising to promote their product to the public. We have always looked at both the quality of a product and the tactics they use to promote it. This is why it is so difficult for a company to earn a top ranking with us and why the top brain supplement recommendations at brainpillreviews.com are so few and far between. If you want something that is going to most closely help you with ADHD symptoms and uses a more potent and powerful formula that is far different than other nootropic supplements on the market, we still recommend that you check out our Editor’s choice for the best brain supplements called, Nitrovit. They use a unique blend that they are upfront about and consists of some of the best nootropics on the market, today. Their message seems simple enough – “We won’t tell you how much a bottle costs, but hey! Give us your credit card information anyway!” – wow, so much for a ‘risk-free’ trial. While we were initially only concerned about Evo Pill, we soon found out that the villains have formed a cult. Predictably enough, the group of ruthless, credit card spankers has used the same format as their landing page, as shown in the images below: We also speak about their “new” product (which they were forced to re-brand and change their product into) at our Geniux review. 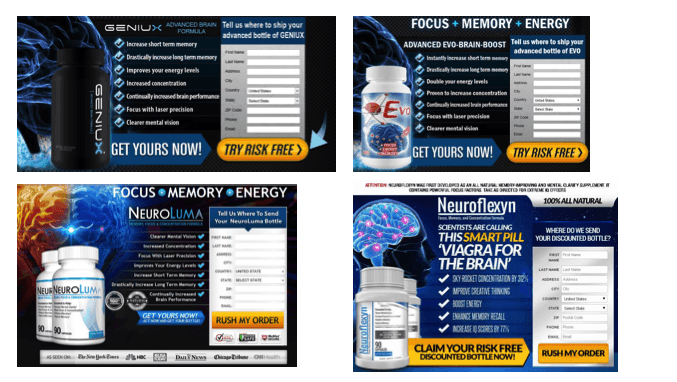 As you can see, each one of these brands promises you a ‘risk-free’, ‘discounted bottle’ that enhances your ‘FOCUS, MEMORY and ENERGY’ just as long as you give them your information. All of these pages use the same bold font, the same blue checkmarks, and the identical flashy yellow-colored buttons. Coincidence? I don’t think so. Well here’s Addium’s landing page, below. They took a page right out of the eVo and Geniux false advertising and immoral marketing guidebook to promote their product which fuels the fire behind why we rank it so low.